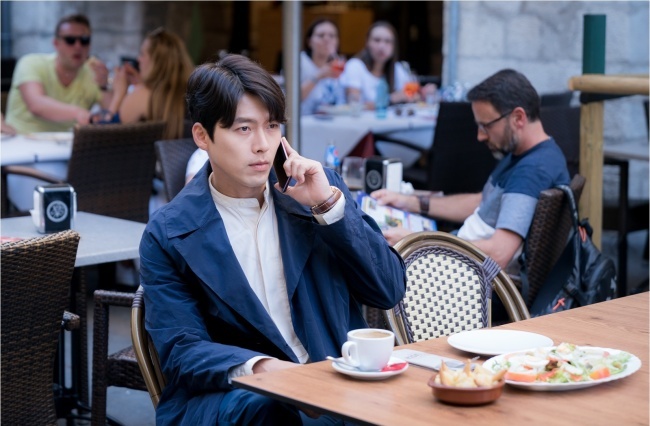 The new tvN series “Memories of the Alhambra,” starring Hyun Bin and Park Shin-hye, enters uncharted waters for a South Korean TV series, as the story centers on an augmented reality game. As the nighttime weekend show bills itself as “suspense romance,” it does not fall short of spectacle and action, featuring fight scenes between players of an AR game as they live out what gamers dream of in the exotic city of Granada in Spain. Director Ahn Gil-ho says he made the show imagining what could become reality in the future. “Though the show depicts a more exaggerated picture than reality, I tried my level best to make it more realistic by imagining (the show) might become reality in the coming years,” Ahn said during a press conference Wednesday. In the series, the CEO of an investment company, Yoo Jin-Woo, played by Hyun, travels to Granada after being contacted by an AR game developer. He then meets Jung Hee-joo, an owner of an old hostel. Yoo’s business trip does not go quite as planned, as he gets entangled in a mysterious incident involving a fight with a rival who used to be his friend. His derailed trip has the potential to strike gold on TV. In one scene revealed in a trailer, Yoo battles it out with his rival Cha Hyung-seok in a sword fight that takes place in the setting of an AR game, which Hyun says is only visible to players in the show. “Other than the users who are wearing smart lenses and online, people can’t see the situation, which meant a great deal of acting based on imagination,” the actor said. He added that similar scenes were shot multiple times from various angles so as to better depict the AR aspects of the series. Though a trailer shows CGI action taking center stage -- what with glorious-looking swords and special contact lenses that allow users to join the game -- actress Park says the show does not fall short on the romance front either. “The show features various elements including melodrama, fantasy, suspense and thriller,” the actress said as she praised screenwriter Song Jae-jung, who is behind the show. The 16-episode series first airs at 9 p.m. on Saturday on tvN and will be available on Netflix.